Along the years, Versace glasses have become a luxury product from the brand. There is no doubt, the brand stand out because of its extravagant designs. The use of baroque elements, plays an important role inside the aesthetic of its products. If you are looking for a glamorous and unique touch you will find it in Versace. Inside the brand, Versace eyeglasses offer different models with a great variety of shapes and colors. All of them give to the customer the comfort and adaptability that everybody wants to have in their eyeglasses. 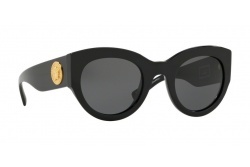 Most of Versace's frames are black with metallic golden temples. It follows a line with the classic Versace's models and the brand also opens another line with new models but all of them use to have something characteristic from the classic ones. Versace sunglasses are different to the rest thanks to their designs. Most of them are characterized by their use of striking colors such as red, blue or black. The brand uses materials such as acetate or metal creating sunglasses with all kind of shapes. Among them, the most predominant are the squared and cat eye among others. Versace also offers clear sunglasses for people who wants for some reason sunglasses with 0 or 1 category. Inside the trendiest models, it is possible to find prints or powerful colors that combine with materials such as acetate and metal. 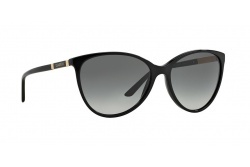 Most of their frames are inspired in the cat eye model although the brand continues betting for more traditional shapes such as the aviator or the rectangular ones. Tribute: This collection is characterized because of their cat eye sunglasses, its thick frame and the different prints. Every model from the collection has a print with different motifs, which make it unique and different to the rest. Medusa: Inside this collection, it is possible to find a great combination of materials such as acetate and the metal. Its models has powerful colors in order to achieve that special touch such as little and metallic tacks in the temples. Glam and #Frenergy: In this case Versace bets for the use of shield sunglasses. Rimless models that make use of striking colors in their glasses in order to achieve an especial and distinctive. Baroccomania: All of them are rimless shaped cat eye or frames. They use metallic details in their end pieces. The name of the brand stands out in their temples. Besides, Versace bets for new geometric shapes such as hexagons, its characteristic shield sunglasses and the brand's logo in a big size. 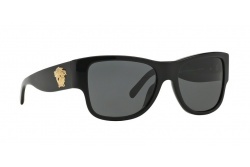 Inside the Versace's sunglasses collection for men we can find squared and rectangular models with thick acetate. 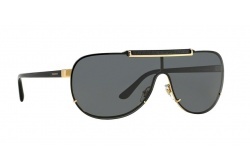 Also, Versace aviator models stand out with metal frames. 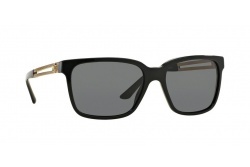 Medusa Ares: This collection develops a sunglass with a very deep personality but quite similar to the classic models. 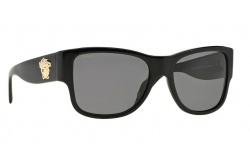 It stands out its thick acetate frame where you can appreciate its logo in a big size. It bets for colors such as black and Havana. 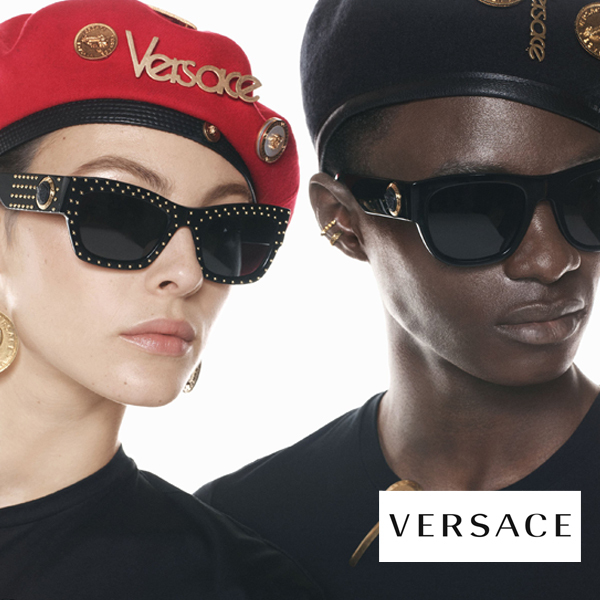 Inside the collection, Versace launched the Black Medusa Ares Visor which is one of the Versace shield sunglasses. Medusa Biggie: It is inspired in the famous rapper Notorious Big, and it is characterized by its hexagonal shape. Full of personality, it takes the logo in its temples and it includes classic colors such as black or Havana and other less conventional such as white. V-Vintage Octagon: It stands out its simplicity in relation to the rest of the brand's collections. It has a hexagonal shape and it also has a very thin black frame. V-Vintage Pilot: Here we can find the combination of a classic model with more modern details. Versace aviator shape is composed by a mix of elements such as the gold frame and the acetate present in the different elements that decorate it. Versace was created in 1978 by its founder Gianni Versace under the name of "Gianni Versace Donna". It started as a brand dedicated to the textile area, but soon it was expanded to the jewel, furniture and accessories area. Gianni Versace was killed in 1997, and after that his sister Donatella Versace, became the new creative director . Inside the iconic Versace's symbol we can find Medusa. Through the classic mythology, its creator wanted to represent the powerful and fighter woman. The brand's icon is present in, practically, all the products giving to them a distinctive and personal touch. Inside our web page, you can find all the Versace glasses' models at the best price. Our professional team will help you during the purchasing process.